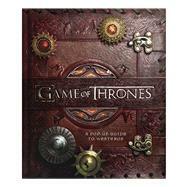 Inspired by the Emmy® Awardwinning credits sequence that opens each episode of the hit HBO® series, Game of Thrones: A Pop-Up Guide to Westeros is guaranteed to thrill the show’s legions of fans. Featuring stunning pop-up recreations of several key locations from the series, including the formidable castle of Winterfell, the lavish capital city King’s Landing, and the Wall’s stark majesty, this bookdesigned by renowned paper engineer Matthew Reinharttakes you into the world of the series like never before. Game of Thrones: A Pop-Up Guide to Westeros features a total of five stunning spreads, which fold out to create a remarkable pop-up map of Westeros that is perfect for displaying. The book also contains numerous mini-pops that bring to life iconic elements of the show, such as direwolves, White Walkers, giants, and dragons. All the pops are accompanied by insightful text that relays the rich history of the Seven Kingdoms and beyond, forming a dynamic reference guide to the world of Game of Thrones. Visually spectacular and enthrallingly interactive, Game of Thrones: A Pop-Up Guide to Westeros sets a new standard for pop-up books and perfectly captures the epic scope and imagination of the series. Matthew Christian Reinhart was born in 1971 in Cedar Rapids, Iowa. He studied industrial design at the Pratt Institute in Brooklyn before finding his calling as a paper engineer. His books include the best-selling Star Wars: Pop-Up Guide to the Galaxy, The Pop-Up Book of Nursery Rhymes, and DC Comics Super Heroes: The Ultimate Pop-Up Book, among many other award-winning titles. He lives in New York City. Michael Komarck is a renowned illustrator and Hugo Award nominee known for his work on several George R. R. Martin projects, including covers for the Wild Cards, Shadow Twin, and Tuf Voyaging novels, and for A Song of Ice and Fire Campaign Guide. He lives in Michigan with his wife and son.